Deathbed scene by E. Physick, Park Terrace . 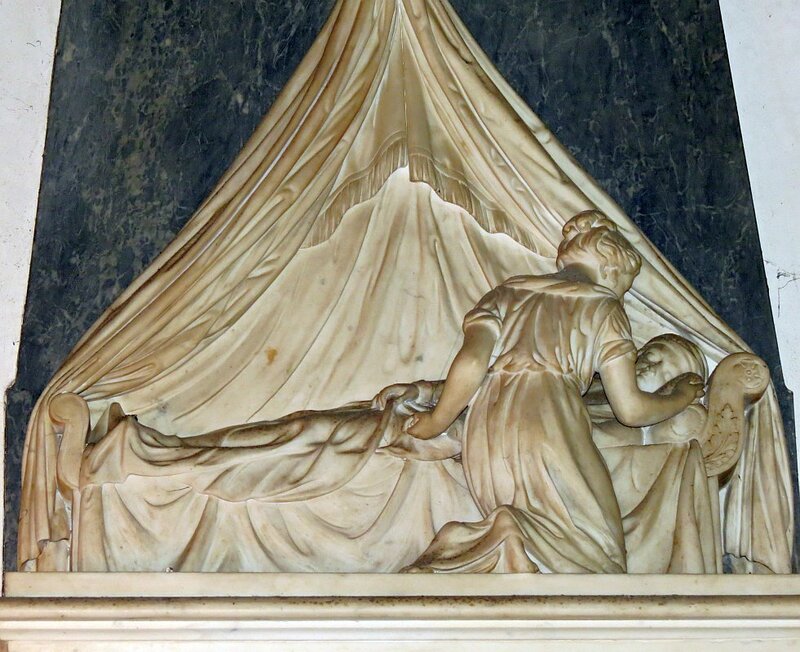 The Physick family of sculptors is of interest for their many early 19th Century church monuments, including a goodly number showing girls carved in alto relievo, mourning by their husbands’ graves. 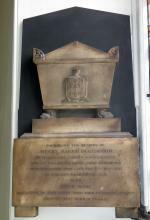 In all there were at least 11 sculptors in the family, including a Mrs R. Physick who married into the name. Edward Physick was the first of them, hailing from Cornwall. The most prominent, or at least prolific of the family were his son Edward William Physick, who settled in London by 1810, and two of the latter’s sons, Edward Gustavus Physick and Charles Physick, and in the fourth generation, a son of Edward Gustavus called Edward James Physick. So in looking at church monuments signed by Physick, to try and identify the particular member of the family responsible, the initials are important, and also the addresses. Even this only gets us so far – after living in Spring Street, Portman Square from around 1810-1824/25, Edward William Physick moved to 16 Park Terrace, Regent’s Park, and there, three of his sons, Charles Physick, Edward Gustavus Physick, and Robert Physick, all lived and exhibited their works at the Royal Academy and other institutions. Both Edward Gustavus Physick and Edward James Physick moved to 20 Upper Gloucester Place in 1829, and thence to 6 Gloucester Place, and others of the family were nearby. A final difficulty is that while we know the addresses of those who exhibited at the Royal Academy, and thus the dates at which they moved, it is by no means unlikely that in some cases they would have been recorded by first and last name only, without the second initial, helping to confuse the record. Typical mourning girl by Physick - probably Edward William Physick . Most of the monuments I have seen are simply signed ‘E. Physick, Park Terrace’, and generally ascribed by Gunnis, the pre-eminent historian of church monuments, to Edward William Physick (1774-1862) – other members of the family would be a possibility. 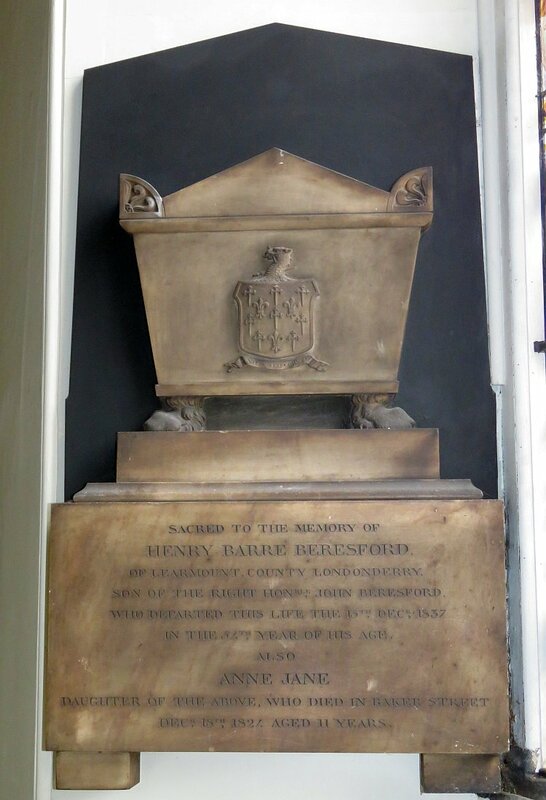 In London, there are half a dozen signed in this way in St Marylebone Parish Church on Marylebone Road near to Baker Street Station, of which the monuments to James Bishop and Richard Goodwin each have a girl leaned against the tomb of the deceased, most decorative. There are a couple more in St John’s Wood Church, and further examples in Greenwich and Carshalton – the Susanna Shepley panel there is to the same design as the James Bishop panel noted above. Outside London, works by the family are scattered across England. 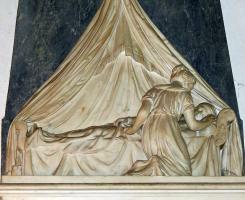 Typical casket-end panel by E. Physick, Marylebone Church . So far as their other work goes, Edward Physick exhibited mainly portrait busts, and a few ideal works. Edward Gustavus Physick, the most prolific of all the family, with 55 works shown at the Royal Academy and an equal number in other venues, chiefly favoured historical subject pieces, and busts too. Edward James Physick showed religious works, and Edward William Physick exhibited a few monuments and other works, and a few of his rather nice ideal female figures and busts survive, though I have seen them only in photographs. 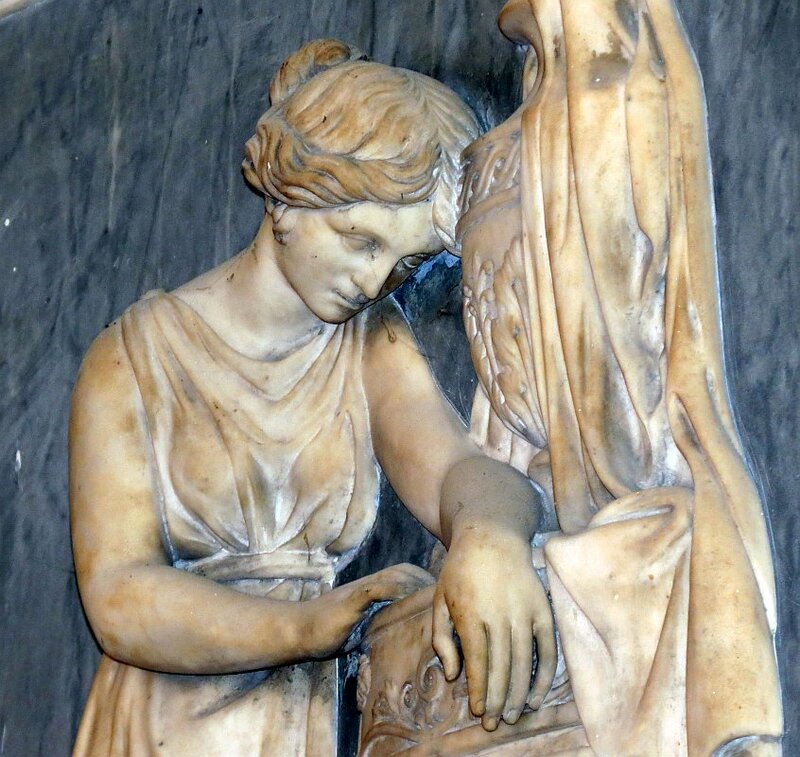 At the Victoria and Albert Museum is one of Edward James Physick’s ambitious figure pieces, Pluto and Proserpine . But despite the success of several members of the family, of public statuary, there appears to be none – Edward Gustavus Physick made a group for the portico of the Female Orphans School in St John’s Wood, but that is long gone.